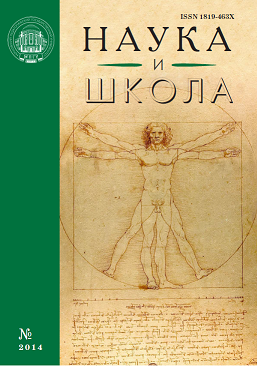 "Science and School" is All-Russian interdisciplinary journal, scientific and pedagogical edition that belongs to leading peer-reviewed scientific journals included by the Higher Attestation Commission of the Ministry of Education and Science of the Russian Federation in the list of editions, recommended for publication of main scientific results of doctoral dissertations. The journal was founded in 1996 at the initiative of Honorary Professor of MSPU, Doctor Habilitatus in Education Samuil E. Kamenetskiy. The promoter of the journal “Science and School” is Federal State Budgetary Educational Institution of Higher Education “Moscow Pedagogical State University”. to provide the general public and pedagogical discussion of the most actual problems of science and education. Editorial staff’s activity is guided by the principles of scientific character, objectivity, professionalism, information support of the most important pedagogical and special innovative researches, compliance with norms of publishing ethics. Scientific field of the journal (in accordance with branches of science): Pedagogical sciences (13.00.01; 13.00.02; 13.00.03; 13.00.08). The target audience of the journal: Russian and foreign experts in the above mentioned fields of science; researchers and experts, teaching staff of universities; post-graduate students, post-doctoral students and students of Russian and foreign universities and research teams, school teachers and administrators. The journal is registered in the State Press Committee of the Russian Federation. Accreditation certificate № 014427 of February, 1 1996. The journal is published 6 times a year. The volume is 200 pages. Subscription indexes in the United Catalogue "Pressa Rossii" – 85008.